2012 – we celebrated in a local park. Photos not yet edited. I spent the morning homeschooling. Schäfer has become obsessed with chapter books so on every 15 minute break he curls up in a chair and reads. I wish he would go outside and run non-stop for 15 minutes, but he’d rather solve a mystery. This afternoon, friends came over. The kids played outside for 2.5 hours in the hot sun. I love that we live in a place where they can run and climb trees and feel a little freedom. Hubs worked until 6pm. Then, we had our first ever “pigs in a blanket” which was a BIG hit with the kids. 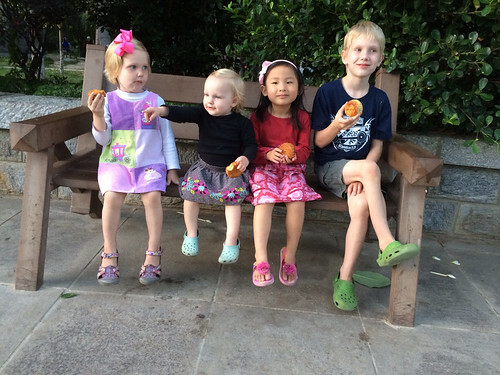 We walked to a local park, ate mooncakes, and watched a fountain show. Then it was time to get then home, scrub the black off their feet, kiss their sweet cheeks and turn the lights off. Here are a couple of photos from Hubs phone. 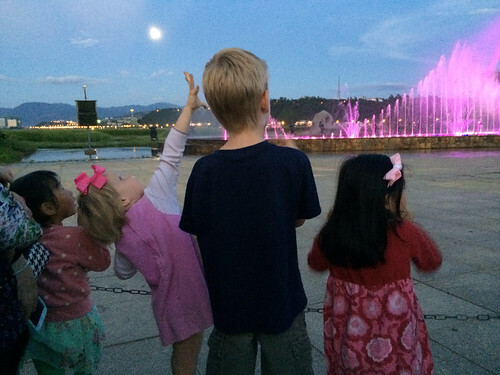 Schäfer, Sianna and Selah watching the fountain show with the moon in the background.